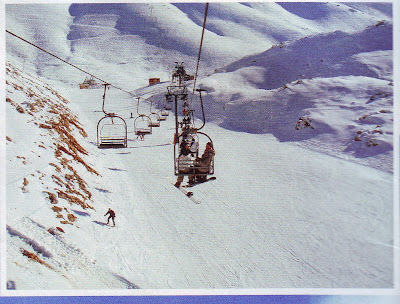 Every tourist visiting Lebanon knows well that this country is the only place in the world where you can ski on the snow in the morning and go for a swim in the Mediterranean in the afternoon, this is due to the mild climate enjoyed by Lebanon and the mountains that rise above the narrow coast, where the highest ski center on the beach is only a few kilometers, giving a splendor landscape during bright weather . The popularity of skiing has spread in Lebanon in the thirties of last century, the first ski lift was built in the fifties at resort Al Arz. Today, there are six resorts in Lebanon interspersed with a number of good skiing slopes , and centers dedicated to meet the needs of skiers ,snowboarders amateurs or professionals, and skiing adventures lovers. In addition to the ski areas, those resorts provide for skiers walking trails and depth on the snow to explore areas allocated for these two types of sport. 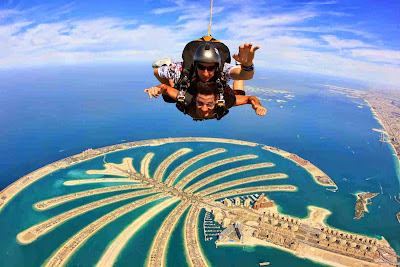 Skydive is of the most exciting world adventures, Palm Drop Zone for skydiving in Dubai or the so-called Club of Skydive Dubai ,is an unique experience for lovers of free fall from the top ,the city became one of the largest centers of skydiving in the world which has led to the growing popularity of the game among the residents of Dubai ,especially after hosting the first international Championship for skydiving in Dubai in 2010. You should travel to Egypt's desert to discover the best ski site on sand dunes globally for its wealth of soft ,deep sand dunes, and if that is not enough for you, there are scenes of breathtaking landscapes along the vast desert that surrounded you from all sides during skiing. You can do this by skiing, whether you are within camp, ski trip or camping a day trip ,provided that guided with a professional guide. Dune in Egypt are varied in forms and sizes to suit everyone, inevitably you'll find the suited one to ski on the sand. The best sand dune skiing in Egypt are in the following areas; the Great Sand Sea near Siwa Oasis in Egypt's Western Desert, Qattaniya sand dunes about 1.5-hour drive from Cairo to Bahariya Oasis, EL Safra and Hadudah dunes located between Dahab and St Catherine's monastery in Sinai. The origins of skiing originated in Egypt since the days of the Pharaohs, where they were slid down the dunes on pieces of wooden panels. 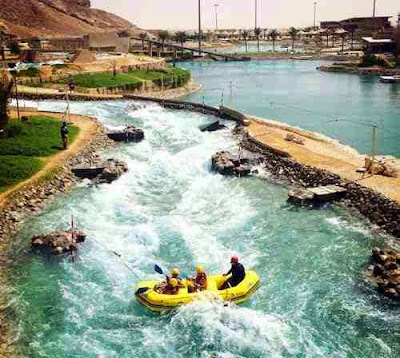 Wadi Adventure Park is the first man-made water park designed for paddling in rubber boats ,kayaks and surfing. There are three waterways for canoeing ,kayak and rafting with 1,133 yards, and a pond for ride on the waves generate waves with a height of three meters every 90 seconds. In addition to a sling for attachment, wall climbing for children ,wire for skating, a large swing ,aerial obstacle courses, airpark ,and family pools, all this behind a magnificent view of Jebel Hafeet, as is pumped five million gallons of water from the Emirate of Fujairah, which lies 111 km. Between adventure and excitement in the water ,Wadi Adventure provides for water sports enthusiasts and families a wonderful day and also provides lessons by certified instructors, guests can purchase or lease equipment from the park.